PRODUCT DESCRIPTION: Glue trap which uses sexual pheromones as attractants and is set out where you either have activity or suspect activity. Emerging adults will find the trap, enter and get stuck on the glue catching them before they are able to mate and lay eggs. Excellent monitoring device which should be used in conjunction with the other treatments. 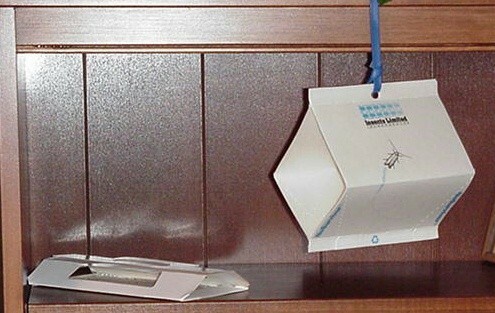 These traps are available in either the low profile version, which is seen in the picture on the left side, or the hanging style which is seen in the picture on the right side. 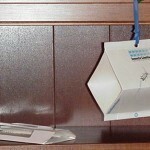 Either trap can be used; generally both are used in any one structure to insure proper installation and coverage. RATE OF APPLICATION: Try to set at least one out in every room where you want to protect furniture or fabric; more if there is a lot of activity present. Hi, I'm in Georgia, something is eating my winter wool sweaters. Not moth. wool beetle or something else? Tried putting everything in plastic bags in the freezer for the summer but still have holes. Prefers cashmere! but woven wool skirts also. Holes appearing for the last five years. What you're describing sounds just like a Black Carpet Beetle. They are super secretive, closely related to ladybird beetles but instead of eating bugs, they eat clothing (fabric).